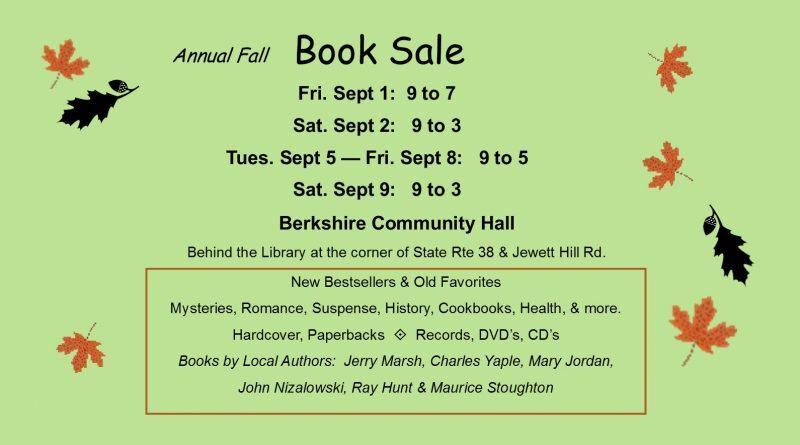 Berkshire Free Library’s annual fall Book Sale will be held: Fri. Sept. 1, 9 to 7; Sat. Sept. 2, 9 to 3; Tues, Sept 5 thru Fri. Sept 8, 9 to 5; and Sat. Sept 9, 9 to 3 in the lower level of the Berkshire Community Hall behind the library. A large variety of newer fiction and non-fiction has been donated this year including children’s books and paperbacks. A group of vinyl records, DVD’s, Cd’s, and other media will be available. Proceeds from the used book sale will be put toward the library’s operating budget. We welcome a book by our newest “local author”, Eileen Morock. Her book Modern Day Burning Bush…Opening the Mind and Heart to Signs and Synchronicity is illustrated by Carrie Tornatore. Eileen is one of the publishers of the monthly Moonlighter. Several other books by local authors will also be available including the 2nd and 3rd books on the Town of Berkshire by Ray Hunt & Maurice Stoughton; Jerry Marsh’s The Brotherhood of Battle; the Civil War Soldiers and families of Newark Valley, NY. Mary Jordan and Joyce Hatch’s award winning book, Dear Friend Amelia, The Civil War Letters of Private John Tidd; Mary Jordan’s 109th N. Y. Volunteer Infantry Remembered 1862-1865; Charles Yaple’s long awaited Jacob’s Land: Revolutionary War Soldiers, Schemers, Scoundrels, and the Settling of NY Frontier as well as Foxey Brown; and John Nizalowski’s books of poetry & essays. The Berkshire Free Library is located at the corner of State Route 38 and Jewett Hill Rd in Berkshire. ← Congratulations Bake-Off Winners !